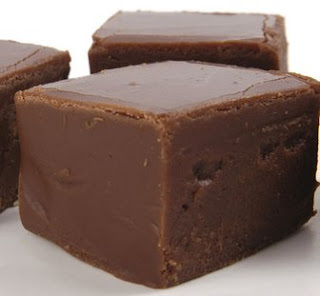 Another take on the typical "Buckeye" or "Peanut Butter Truffle." And here I told ya'll I wasn't big on desserts. I seem to be full of em lately. I'm gonna explode if I don't be careful. In a mixing bowl, combine sugar, peanut butter and butter; mix well. Shape into 1-inch balls and place on a waxed paper-lined cooking sheet. Chill for 30 minutes or until firm. Meanwhile, melt the white baker's chocolate in a microwave-safe bowl. 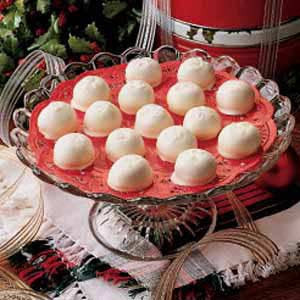 Dip balls and place on waxed paper to harden. Yield: 2 dozen. In a small mixing bowl, beat the cream cheese, chocolate, sweetener and vanilla until smooth. Stir in pecans. Pour into an 8-in. square dish lined with foil. Cover and refrigerate overnight. Cut into 16 squares. Serve chilled. Yield: 16 servings. 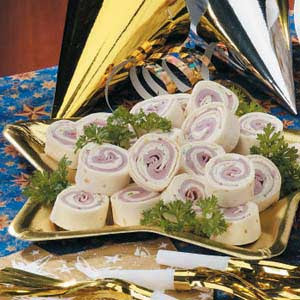 This is a really tasty pinwheel appetizer that's easy to make and fun to eat with a yummy cream cheese filling layered with ham! 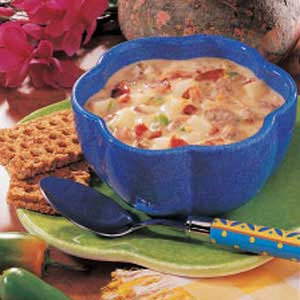 In a small mixing bowl, beat the cream cheese and salad dressing mix until smooth. Add onions; mix well. Spread about 3 tablespoons over each tortilla; top each with two ham slices. Roll up tightly and wrap in plastic wrap. Refrigerate until firm. Unwrap and cut into 3/4-in. slices. Yield: about 7-1/2 dozen. Here's a nice salad to serve during those hot summer months that we enjoy here in MN. Or elsewhere too! 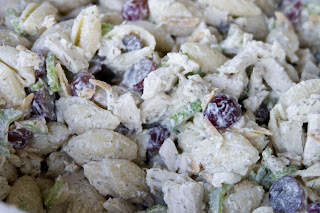 In a large bowl, combine chicken, grapes, celery, onions and eggs. In another bowl, combine the next nine ingredients; stir until smooth. Pour over the chicken mixture and toss gently. Stir in almonds and serve immediatelyif desired, or refrigerate and add the almonds just before serving. Garnish with kiwi if desired. Yield: 6-8 servings. I'm not a huge fan of dessert. Well...that's not entirely true. I'm not a huge fan of MAKING desserts. I'll eat them, but we don't typically around here. However, this is on the agenda this weekend to follow up the fab soup below. You can't beat peanut butter. I mean really. In a small bowl, combine cracker crumbs and margarine. 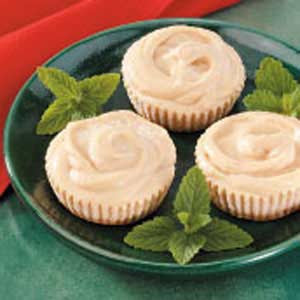 Press about 1 tablespoon each into 12 paper-lined muffin cups. In a large bowl, whisk milk and peanut butter until blended. Whisk in pudding mix until smooth. Fold in whipped topping. Spoon into cups. Freeze until firm. Remove liners and let stand at room temperature for 5 minutes before serving. Yield: 1 dozen. In a large saucepan, combine the first nine ingredients; bring to a boil. Reduce heat; cover and simmer for 15-20 minutes or until potatoes are tender. Stir in beef and 2 cups of milk; heat through. Combine flour and remaining milk until smooth; gradually stir into soup. Bring to a boil; cook and stir for 2 minutes or until thickened and bubbly. Reduce heat; stir in cheese until melted. Add cayenne if desired. Top with bacon just before serving. Yield: 6-8 servings (about 2 quarts). Lookin forward to this one. I saw it in Taste of Home Magazine and am excited to try it. It'll be done in no time and is a nice quick and easy meal when you don't have a ton of time to be standing around in the kitchen making a huge feast. In a saucepan, brown ground beef; drain. Add salsa, mayonnaise and chili powder; mix well. In an ungreased 2-qt. baking dish, layer half of the meat mixture, chips and cheeses. Repeat layers. Bake, uncovered, at 350° for 20-25 minutes or until heated through. Just before serving, top with tomato and lettuce. Yield: 6 servings. 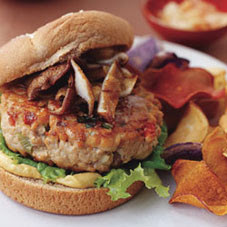 Also on the menu this week...Tuna Burgers! Although in all honesty, they are more like sandwiches than burgers. A nice twist on tuna...and burgers. :) Easy to put together and doesn't require a ton of ingredients that you may have to run right out and buy. And if you do, it's cheap! I promise. In a bowl, combine eggs and tuna. Add the cheese, green pepper, onion, garlic, salt and pepper; mix well. Stir in the mayonnaise. Spoon about 1/2 cup onto each roll; wrap individually in heavy-duty foil. Bake at 400° for 15 minutes or until heated through. Yield: 8 servings. Cook fettuccine according to package directions. Meanwhile, in a large skillet, saute the spinach and garlic in oil for 2 minutes or until spinach begins to wilt. Add the shrimp, tomatoes, Italian seasoning and salt; saute for 2-3 minutes or until shrimp turn pink. Drain fettuccine and add to skillet; toss to coat. Sprinkle with Parmesan cheese. Yield: 8 servings. 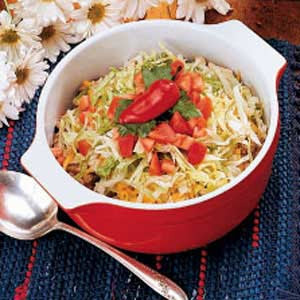 Who doesn't like a fabulous enchilada? Seriously. Preheat oven to 350°F. Heat large skillet spayed with cooking spray on medium heat. Add onions and garlic; cook and stir 2 min. Add chicken, 1/4 cup of the salsa, cream cheese, cilantro and cumin; mix well. Cook until heated through, stirring occasionally. Add 1/2 cup of the shredded cheese; mix well. We had these at my friend, Rachel's house last Monday for our Memorial Day get-together and goodness they were SOOOOO good and addicting. They make a nice little dessert that you might not feel bad about if you just keep nibbling off of them. ;) Or at least it's easier to convince yourself you're not doing anything bad when you can just take one at a time... HA! Let me just believe that, ok? Crush Oreo® cookies in a food processor until very fine (powdery). Add softened cream cheese. Work well with hands or heavy mixer. Chill mixture for an hour or put in freezer 15-20 minutes. Remove from fridge and roll into bite-sized balls. Dip into melted almond bark and let dry on waxed paper. Keep refrigerated. Top with extra crushed cookies or drizzle extra bark on top. I got this recipe out of the latest Kraft Food & Family magazine - summer edition. Chris and I just got our new gas grill from his Grandma and we've had a lot of fun experimenting and grilling. 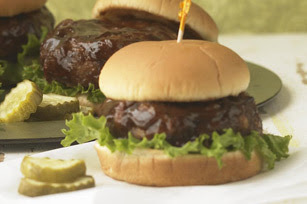 This recipe was AMAZING and a nice easy twist on just a plain grilled hamburger. Preheat grill to medium-high heat. Mix meat, cheese, bread crumbs and 2 Tbsp. of the barbecue sauce. Shape into four patties. Place patties on grill; cover grill with lid. Grill 4 to 6 min. on each side or until burgers are cooked through (160°F), brushing with remaining 2 Tbsp. barbecue sauce during last 2 min. of grilling time. For more flavor, try adding 2 Tbsp. 100% Grated Parmesan Cheese and 1/4 tsp. Italian seasoning to the meat mixture.